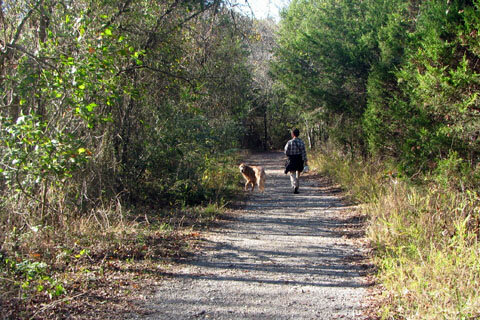 We had heard about Barfield Park; but thought it was a minor hiking park. 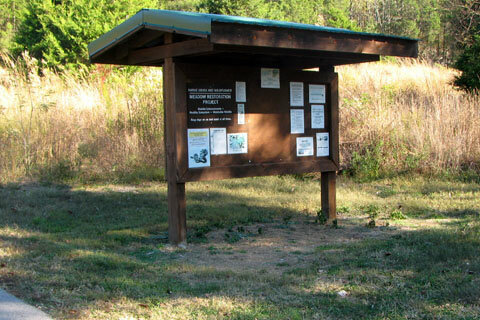 The Murfreesboro (TN) City Park was supposed to be located a few miles southwest of the City. We were going to Murfreesboro for car maintenance, so we decided to stop by the Park for a quick afternoon hike. Directions: From Interstate 24, take exit 81 south on Hwy 231 toward Shelbyville. Continue on Hwy 231 for about 3 miles to Volunteer Road. Turn right and continue about a mile to the trailhead parking at the Wilderness Station. Note: the turn on Volunteer Road is unmarked. 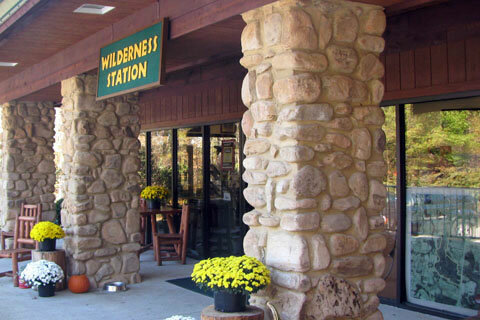 The Wilderness Station is the headquarters for the outdoor adventure activities. Restrooms, water, trail information, and trail snacks are available at Wilderness Station. From the Wilderness Station, the paved path leads from the parking lot in a northerly direction. The path has a gentle grade as it enters a cedar glade region. 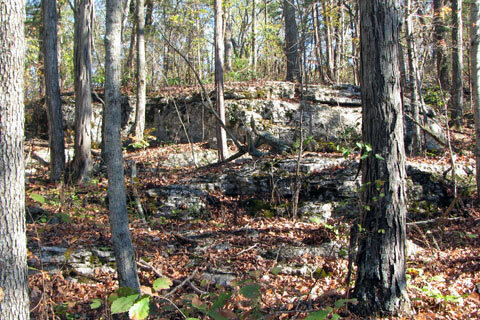 The cedar trees and limestone outcroppings are typical features of the glade. In .20 miles the path come to the first junction. Another paved path leads to the right. It leads down a steep hill for .20 miles to shelters #3 and #4. Following the main path (straight or to the left), it is .45 miles to the next junction. At the intersection continuing straight leads to the Campground in .40 miles. The path to the right leads to the River Overlook. 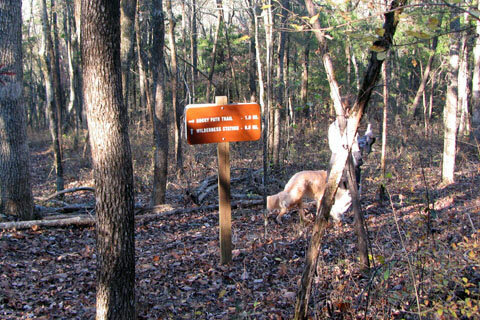 To walk the full red trail, Marshall Knob Trail, follow the path to the right to the River Overlook. In .10 miles the paved path ends at the viewing point. 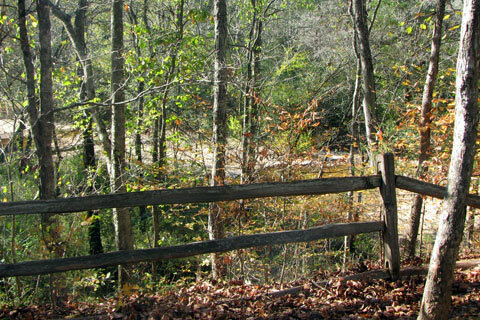 From the right side of the Overlook, go through an opening in the rail fence and descend sharply to the river. 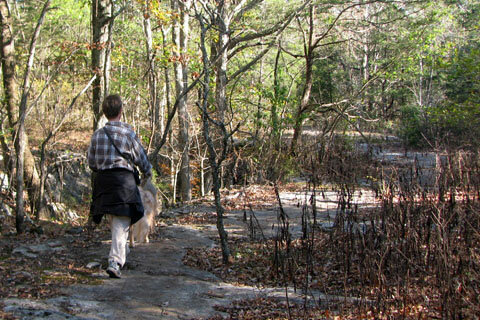 Follow along the Stones River for about a quarter of a mile, then turn away from the river as the trail goes near the campground. A restroom is available at the campground. There is no drinking water. 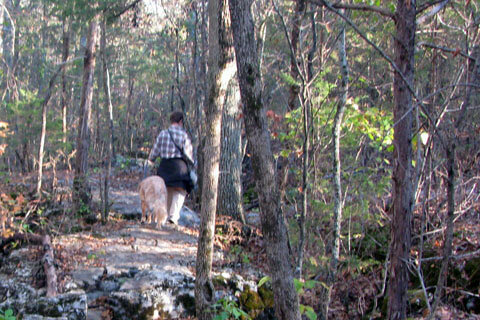 The trail passes campsites B and C as it returns along the rocky banks of the river. Leaving the river again, the trail junctions with the Gravel Road in a hundred yards or so. The Gravel Road crosses the Marshall Knobs Trail, red blazed. Going left, it is .20 miles to the Campground. To the right is not designated by any signage. 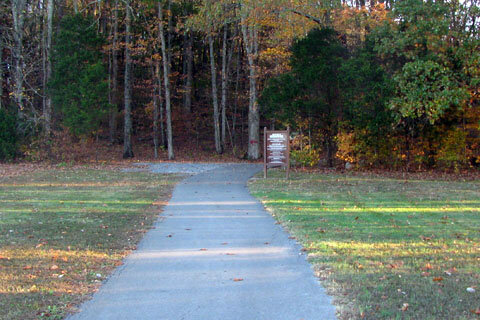 The road is used to access the campground by Park staff. The easiest return to the Wilderness Station from the Gravel Road is to go to the Campground, turn right on the paved path and continue straight on the paved path. It is 1.25 miles distance. 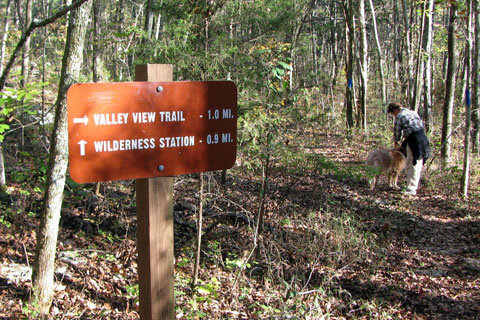 Continuing on the Marshall Knobs Trail, red blazed, it is .20 miles to the start of the Valley View Trail, blue blazed. Staying straight on the Marshall Knobs Tail it is only .10 mile to the end of the Valley View Trail. 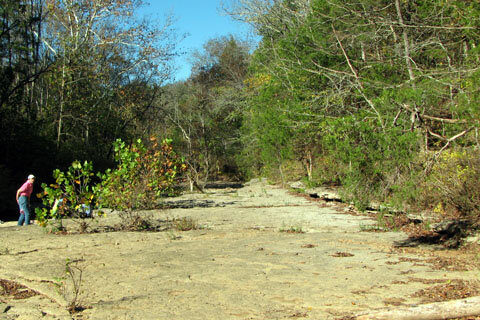 To walk the big loop, go right on the Valley View Trail.The trail stay mostly level as it nears sink holes and crosses exposed limestone. The trail comes close to Hwy 231 before it turns left and climbs a little to the edge of a field. 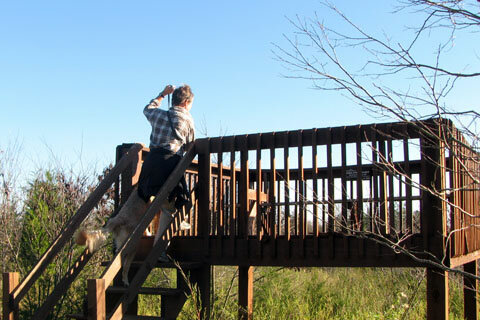 A raised wooden observation deck gives a valley view in .70 miles from the start of the trail. From the overlook the trail begins a westerly trend as it reunites with the Marshall Knobs Trail in .45 miles - 2.80 miles from the start at Wilderness Station. Go right where the Valley View Trail junctions with the Marshall Knobs (red) Trail. The trail climbs over a knob and begins to descend before the Rocky Path Trail, white blazed, branches off to the right. 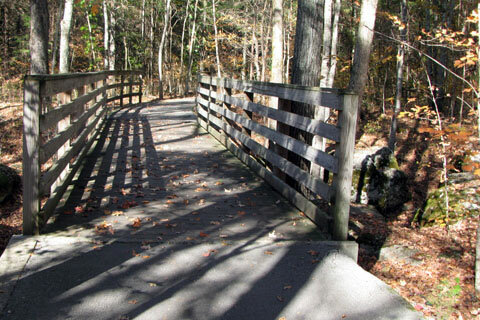 The Rocky Path Trail is very similar to the Valley View Trail and is worth the 1.10 miles distance. Staying straight on the Marshall Knobs Trail it is .25 miles to the end of the Rocky Path Trail. 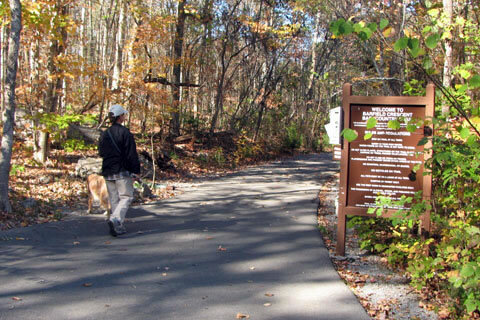 To continue on the big loop, go right on the white trail. 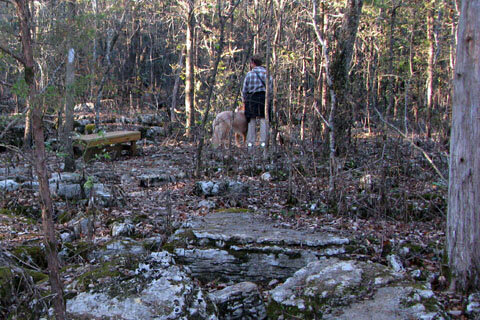 The Rocky Path Trail weaves through more sink holes and crosses more exposed limestone than the other trails. 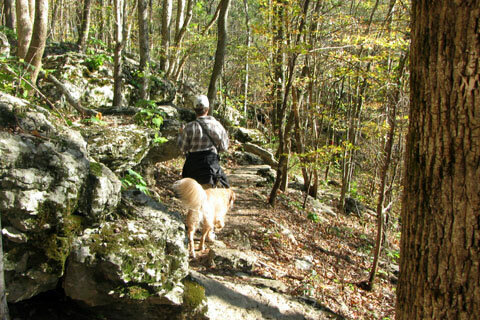 After the Rocky Path Trail rejoins the Marshall Knobs Trail - 4.10 miles, it is .45 miles to return to Wilderness Station. 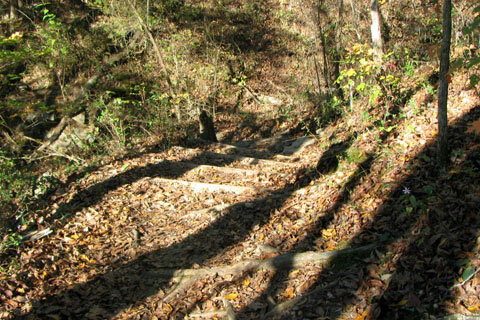 The total trail distance for the Marshall Knobs Trail, red blazed, is 4.55 miles. 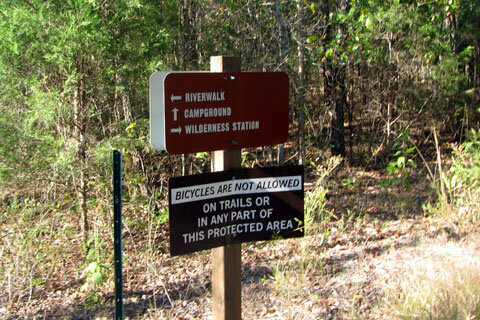 Extra mileage maybe easily added by visiting the campground or the path to shelters 3 & 4.